Kia ora koutou, My name is Eadaoin Roughan and this year I have been given the privilege of representing Villa Maria College as Head Girl. I am a proud New Zealand-born Solomon Islander, and I love the sciences and maths. I came to Villa Maria College in 2015 as a Year 9 student and over the years have come to learn what it means to be a Villa girl. 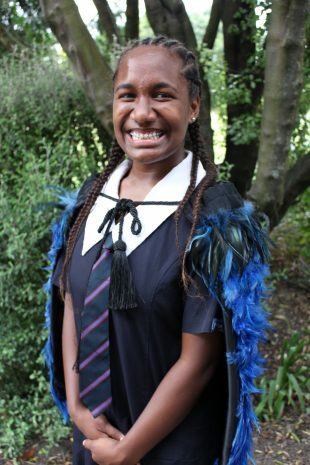 Through its special character, Villa weaves the values of Whakaute (Respect), Manaakitanga (Hospitality) and Tika (Justice) into all aspects of College life. Whether it be through service, academics or cultural aspects of the school, all students reflect these values. Mercy Day is one of my favourite events of the school year. Every second year, Villa Maria College hosts a Mercy Day, inviting other students from the community with disabilities to take part in fun activities with the students from Villa. Last year, a petting zoo was set up on the school grounds for visitors and students to interact with. The students also organised a wide range of interesting activities for our visitors. My group hosted a gingerbread decorating activity that was very popular among all. However, the highlight of Mercy Day is the concert that we put on, which was enjoyed by students and visitors alike. Villa offers a wide variety of opportunities for all students. Last year, I had the privilege of meeting the New Zealand Governor-General Dame Patsy Reddy, which was an inspiring experience. This year, the College leaders and I will focus on encouraging Villa girls to try something new and give every opportunity a go. I will also introduce a Māori “word of the week” to our College community, each new word will be one of encouragement, for example “Ka wani kē” meaning “wow”. A great amount of support comes from all my family, friends and teachers, without them I wouldn’t be where I am today. This support keeps me going and encourages me to achieve more and more. At Villa, there is so much talent in every student which inspires me too, we support and inspire each other, which creates a great environment for everyone. Following my graduation at the end of 2019, I hope to study chemistry and biology at University. However, I like to focus on the present, and experience all this year has to offer.